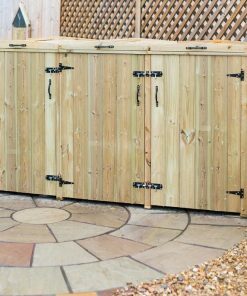 A log store can be a fantastic buy to not only make your garden look neat and tidy, but also to save money and fuel efficiency. Log stores aren't new products, but as most people these days have central heating, they've become slightly less popular. However, an upsurge in the sales of wood burning stoves, wood barbecues and even smokers means that log stores are starting to become more desirable. But why should you buy one? What is a Log Store? A log store is basically a box, generally open on one side. Usually a store is built from wood slats, with large gaps between planks to ensure lots of air circulation. There is awatertight roof and floor, as well as the possibility to anchor your store to the ground. Many different types of timber are used to make log stores. Probably the most popular kind of wood though is pressure treated redwood. This combines affordability with durability, making it a good choice. In terms of maintenance, a little will be necessary. Outside timber should be treated around once a year with a stain, to keep it looking good and to ensure it remains weatherproof and free from fungus and mould. Wood burning is becoming more popular these days. Perhaps you have a wood burning stove or open fire at home. Or maybe you're a big fan of outside cooking and enjoy using a wood burning barbecue or smoker. If this is the case, then you've probably got a stack of chopped wood sitting somewhere around your property. For the most part you can't just burn wood. Whilst there are a few kinds of wood that can be thrown immediately on the fire, most UK firewood needs to be seasoned. This is because cut wood contains around 50% to 60% moisture. Seasoning will reduce that moisture percentage to around 20%, which is good news for you. Burning unseasoned wood is not just inefficient (since it tends not to burn well and doesn't create much heat, it can also be dangerous. The high amount of smoke and soot created by burning unseasoned wood can make chimneys fire hazards. 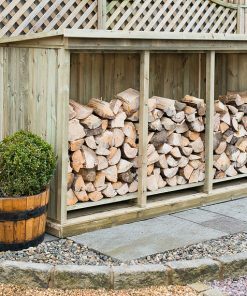 A log store is perfect for seasoning your wood. Once the wood is cut and placed in a cool dry place with lots of air circulation (like in a log store! ), it can be left for three to six months to season properly. Then all you need to do is throw it on the fire! Of course, you can buy pre seasoned wood, or clay oven seasoned wood. But if you've got a log store you can season your own wood, and avoid paying extra for something that you can easily do yourself. And then comes the issue of weatherproofing. In the UK we don't exactly have the driest of climates, and that's bad news for wood. All that wood seasoning will go to waste if you simply leave your firewood out in the rain. And we're not just talking about covering wood up either: moisture can easily seep up through the ground and into your wood from below. Wood that gets and stays wet doesn't get seasoned and therefore doesn't burn properly. But it can also rot and mould, meaning you can't burn it at all. And that means that all that money you spent on firewood (or time you spent collecting firewood) has been wasted. Fortunately, a log store is going to protect your firewood from the elements. So that small initial investment made to store your wood properly means long term savings. Finally, there's storage. 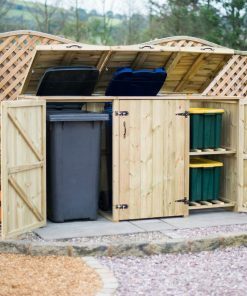 Of course, having a log store means that you don't need to keep an unsightly pile of wood under a tarp in your garden. And keep firewood in a store is safer than having a wood pile if you have young children who like to climb around. But many forms of log store also come with additional storage. A storage compartment will usually have a door and a hasp, so a lock can be fitted. This is great for storing small tools or just random garden items that would otherwise clutter up your garage or shed. If you decide that you do want a log store, then you're going to need to ensure that you have enough room on your property to have one. This means measuring the footprint of the store. Stores do come in a variety of sizes, so you'll be sure to find one that fits your needs. Ideally, log stores should have the open side facing to the south, so that there's plenty of air circulation to help season wood. Preferably they should be free standing, rather than against a wall or fence, again to help with air circulation. Don't forget though, that someone will need to collect that wood in the middle of winter, so don't put your store too far away from the house! For this reason, some people choose to have a large log store for wood seasoning on their property, and another smaller store close to the back door of the house for ease of access during bad weather. A log store can be a great addition to your garden. Not only will your property look more attractive, but you'll also be saving yourself money by being able to season your own wood, and by keeping the wood that you have in good burning condition. 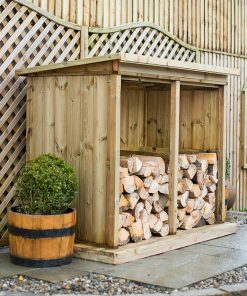 If you have a wood burning smoker, fire, stove, or barbecue, then a log store is a fantastic investment.